The most common types of tattoo machines are coil and rotary. Tattoos are most often made with coil machines − they make fewer errors in the impact of the needle, it is possible to adjust the amplitude of the needle movement there. They are also suitable for soft shadows (if it is a shadow machine). Rotary tattoo machine in use is much less common, but good for a dense painting. The advantage of a rotary is that they are quieter than coil machines. They are also used in permanent make-up. Magnetically motive force in a Rotor machine created by the winding is first converted into rotational motion of the rotor (hence the name of this devices) and only then by means of a mechanical transmission this rotational motion becomes translational, that is, the one that must be “sent” to the needles. What is the secret of rotor machines popularity? First, the rotary machine has higher efficiency, since the electromagnets always work at the minimum air gap, and therefore, the rotary unit is able to push the needles with greater force. Secondly, there is no impact in the working cycle of the rotary machine, which makes its operation quieter and smoother than when a master works with coil device. Rotors provide maximum comfort for the master; rotor give a special advantage to the home-working masters as they do not disturb their neighbors. Thirdly, modern rotors often have the ability to adjust the rigidity of the impact, which again makes the work of the master easier and more comfortable, since there is less risk of damaging the skin. Finally, the client’s taste is increasingly tending to multicolored art tattoo made mostly by rotors. Hence a simple question arises: is a rotor machine better than the coil one? All rotary machines make worse quality contours than coil machines. Secondly, rotary machines can significantly load the skin because needles come out of the skin with a delay, causing the skin trauma. Third, rotary machines are inferior to good induction in the amount of pigment introduced in one cycle. Fourth, rotary machines are often very uncomfortable when working in problem areas, where there are abundant body fat or cellulite are placed. 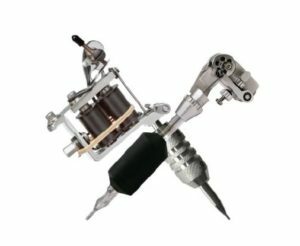 Summarizing the above, it is fair to say that any professional tattoo master must have in his studio both rotary and coil machines.